407 volunteers served 2,460 clients while donating an incredible 68,134 hours of time! Our Hospice/Palliative Care volunteers provided support to 194 clients in their homes, the hospital setting and at our Hospice Day program. This support and compassion was also extended to families facing the loss of loved ones via caregiver support and bereavement support programs. Our Meals On Wheels volunteers delivered over 39,000 hot and frozen meals to more than 400 clients. For many seniors, the trusted Meals On Wheels volunteer who comes to their door with a warm smile is the only person they speak to or see all day. Our Diner’s Club volunteers served over 5,000 meals and provided entertaining, insightful and fun programs to more than 400 clients. Our Escorted Transportation volunteers drove nearly one million kilometres, ensuring that 794 clients got to their medical appointments and treatments on time, and helped them navigate through the hospital hallways. Whether it is a short chat on the telephone or a visit at home, our Friendly Visiting/Security Reassurance volunteers provided more than 900 clients with a sense of security and friendship. And let’s not forget all of our volunteers who helped with awareness events, musical events and fundraisers over the past year. Once again, our volunteers have proven the difference they make in the lives of our clients, seniors, adults with physical disabilities, and persons who have been diagnosed with a life-limiting illness and/or palliative diagnosis. To all of our amazing volunteers who go above and beyond to help our clients, THANK YOU!!! Volunteer with us! We have a variety of programs and services and our volunteers are integral to their success. Whether it’s once a week or once a month, we need your help! Visit Volunteer with CHSLC for more information. We’ll work around your schedule to find a volunteer position that best suits your interests and skill set. 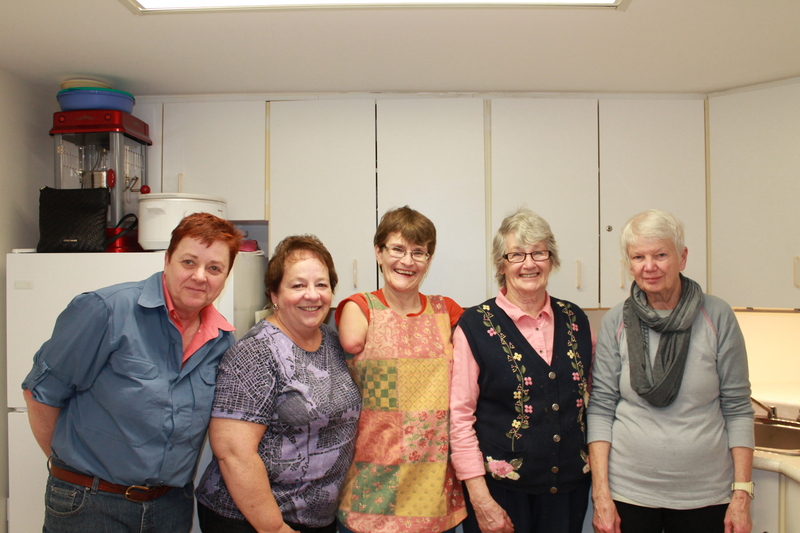 Featured photo: A small group of our dedicated volunteers in Pakenham. Volunteering with the Diner’s Club gives Mary the opportunity to be a part of a meaningful social event while only having a couple of hours each month to volunteer. CHSLC makes it easy for her and other volunteers who want to give their time to help out in a way that suits their time availability. Diane – As one of six siblings in her family, Diane is involved in caring for her mother who has Alzheimer’s. She finds that bringing her mom to these events keeps her mom’s mind sharp. Diane is happy to volunteer with a program that acts as a helpful boost to its participants’ health and well-being. Helen – For the past five years, Helen has been volunteering with the Diner’s Club once every six weeks. She is able to volunteer in a way that fits her lifestyle and allows her to pay it forward. Paying it forward is a motto that Helen lives by and she feels that more people could benefit from this life philosophy. By paying it forward, Helen herself is also benefiting. She loves the social connection and is able to be involved with a great group of people. She feels like a valued member of a special community. Thank you to all of our incredible volunteers who are so willing to give their time to help others. We couldn’t do what we do without you! Learn more about volunteer opportunities, by visiting our website and reading more about volunteering through our other articles. Doreen’s delicious soups are warm and comforting – just like her personality. For 15 years, this former professional cook has been creating soup masterpieces for CHSLC’s Pakenham Diner’s Club. She became involved in the Diner’s Club through her daughter Myrna, a client services assistant for CHSLC. Doreen’s and Myrna’s roles have expanded over the years – in fact most diners will agree that they are the heart and soul of the Diner’s Club. Doreen rarely needs a recipe, even though she seldom makes the same soup twice. Her repertoire is expansive and her soups never fail to delight the taste buds of the diners. While each soup is tremendous, a fan favourite is her homemade tomato soups. Each week Doreen sets the menu and prepares some of the meal ahead of time at home. She then loads the ingredients into two Little Red Riding Hood-style baskets and makes her way to Five Arches, where Diner’s Club takes place. Once there, other volunteers such as Helen, Mary and Diane, will help to prepare the sandwiches and bring the desserts, but the soup is always Doreen’s baby. With Doreen’s many years of experience working in a kitchen and several years preparing the meals for Diner’s Club, the weekly event goes off without a hitch – usually. She and some other volunteers recall a cooking fiasco where it was assumed the eggs brought in for egg salad sandwiches had already been cooked. They hadn’t. While stressful at the time, the ladies laugh about it now. Doreen’s time spent volunteering isn’t just about preparing great food. It’s also about connecting with the clients. She loves hearing the stories and laughter coming from diners as they’re playing cards before lunch. And after the food is prepared she always heads out to the dining room to visit and chat. For Doreen and the other Diner’s Club volunteers, their involvement in this weekly event is about being grateful for their own health and well-being and paying it forward. As passionate as Doreen is about cooking, she feels the same passion for helping others. Thank you Doreen for all that you do and the other volunteers as well! Visit our website to learn more about our services or contact us anytime. There are many reasons why our volunteers dedicate their time and energy to helping us help others. For some, it’s about connecting with people, sharing stories and experiences. For others, it’s simply about having the time. Our whole lives we look forward to the end of our working career. We want to stop the busy train and get off at Retirement Station. We dream of this day. But, as we hear time and again, taking a break from our daily routines and the working life is not all it’s cracked up to be. Sure, the first few weeks or months of retirement are blissful, but what about after that? As humans we need to keep moving and feel useful to live a balanced life — at any age. One of our long-time volunteers, Dave, told us he began volunteering because he had the time. As a former member of the military he was used to working hard and for a purpose. Dave knew right away that he didn’t like the stand-still life that retirement awarded him. He liked not having the stress associated with work, but he missed the routine and noticed that he had a lot of time available to him. He wanted to be busy again and work with an organization that could really use his help. Organizations like ours are always in need of volunteers and monetary donations. We have a strong group of people who are dependable, reliable and glad to help. But, the reality is we have a lot of programs! Fulfilling the needs of each department takes volunteers with various skill sets. Someone like Dave who works in our cafe and drives for Meals on Wheels is just as important to us as our volunteers who visit with our clients for afternoon tea. He’s just as important as the person who clicks on the “Donate” button on our website and makes a monetary contribution to our programs. We all have different skill sets, strengths and available time that can be useful to our beloved clientele. Dave began volunteering as a driver for our Meals on Wheels program and delivered hot meals to our clientele in the area. When his granddaughter came to visit, his volunteering didn’t stop — he brought her along with him. When you deliver meals to a client’s home time after time, you get to know the person well. We always ask how the person is doing and engage in a little small talk before getting in the car and driving to the next house. When Dave’s granddaughter came along on the car rides, he introduced her to the clients and they warmed up to the sight of her then 4 year old face! Now, Dave’s granddaughter is 18 years old and the last time that she came to visit, she went on a Meals on Wheels tour with her grandfather again. As an organization we are working to create a community within our community. Seniors and persons with disabilities tend to feel isolated and alone. When people like Dave drop off meals to our clients, they’re bringing a sense of community to our clients’ front door. By engaging in conversation and introducing his granddaughter to our clients, Dave is furthering the community and giving our clients a sense of belonging. Dave as well as all our volunteers are important to our organization — we truly would not be able to operate without them. Thank you.